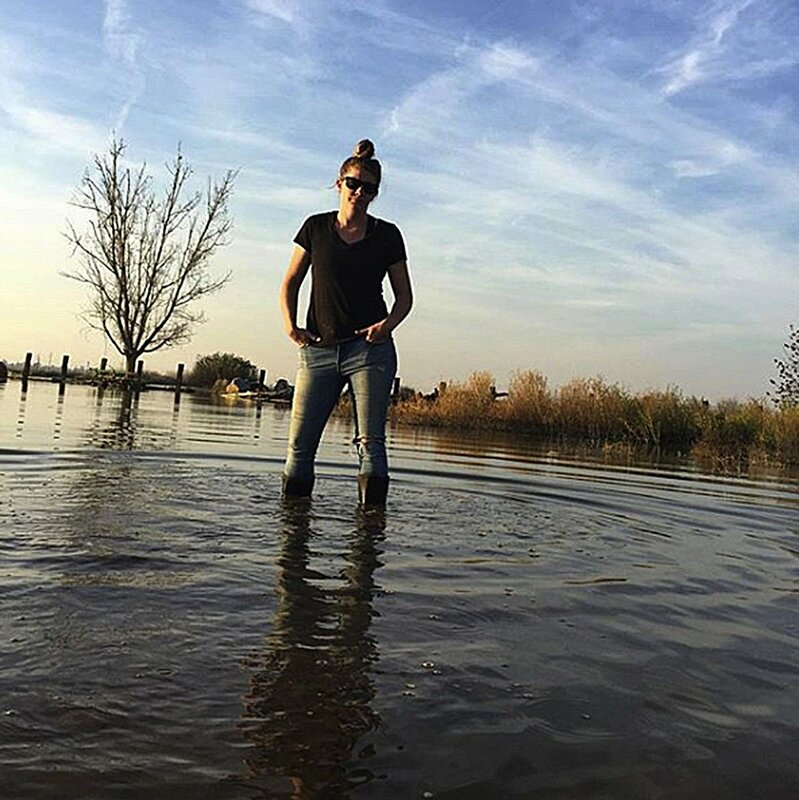 Meredith Bell of Autonomy Farms stands feet-deep in water in the middle of a field — hers. Two weeks before this photo was taken, it was filled with rows of organic produce like tomatoes, peppers, eggplant, cucumbers, squash, beans, okra and basil. Autonomy Farms also produces grass-fed meat and organic eggs. Meredith Bell and Nick Etcheverry, owners of a local organic farm, appeared on the Jan. 3 season-three premiere of "Billion Dollar Buyer," a reality television show. Along almost every entrepreneurial journey, there’s a pivotal moment. A moment when it seems the story could go one of two ways — the bank account is dwindling in a gap between big deals, clients consider leaving, an important decision needs to be made to either keep pushing when it seems difficult, or toss in the towel and give up. It’s not often as dramatic as portrayed in television shows — with music and cameras zooming in on worried faces. But sometimes it is. Picture a woman wearing a T-shirt, jeans and boots, hands in her pockets, a tidy top-knot and black sunglasses. She’s standing feet-deep in water in the middle of a field — it’s hers. Two weeks before the photo was taken, it was filled with rows of organic produce like tomatoes, peppers, eggplant, cucumbers, squash, beans, okra and basil. The caption reads: “Day 13. #gofarmyourself #flood #bakersfield #kerncounty.” The date was March 3, 2017, exactly 10 months prior to the airing of their appearance on "Billion Dollar Buyer." Meredith - the woman pictured - and her partner Nick run Autonomy Farms, a local operation that practices sustainable agricultural practices. They describe their philosophy as one that respects nature. It’s hard to ignore the tragic irony that Mother Nature wiped out their crops and hens in the form of a flood, the worst the area had seen in over 30 years. My own interactions with Autonomy Farms have been small, local, approachable. They’ve occurred at neighborhood farmer’s markets organized by The Hen’s Roost, another Bakersfield business with a permanent market downtown and the words “EAT LOCAL” on the roll-up door to their shop. Autonomy sells their organic produce, and humanely raised meat and eggs, to multiple farmer’s markets throughout California, including Calabasas, La Cañada Flintridge, Burbank, Encino, Hollywood, Pacific Palisades, Brentwood and Santa Monica, in addition to Bakersfield. This is not easy work. It involves frigid early mornings in the winter, hot afternoons in the summer, run-ins with pests like sharp-toothed bats, mud-covered clothes, seasons with long hours and little sleep and missing daily life with family and friends. Autonomy represents a new wave of modern innovation, grit and persistence in our community, and we should celebrate businesses like it. The same resolve that led Meredith and Nick to start Autonomy Farms in the first place has kept them going after the flood. A rain-soaked field is not the end of the story. They kept their spirits up after devastation. Locals held fundraisers and made donations to help them put the farm back together. And last week, on "Billion Dollar Buyer," Meredith and Nick met with billionaire hospitality mogul Tilman Fertitta, chairman, CEO and sole shareholder of Landry’s Inc., one of the largest restaurant corporations in the United States. The reality television show introduces promising companies across the country to one of America’s most successful businessmen. Featured entrepreneurs present their small business to Fertitta hoping he will place a large purchase order. But before making their pitch, they must prove to the hospitality mogul that their product is worth it, through challenges and customer feedback. On deal day, Fertitta was impressed by the duo’s drive and offered to buy $50,000 in meat, $25,000 in produce and $25,000 in eggs for four Mastro’s locations — $100,000 in total. He hopes that the deal will allow them to get back on their feet. Last year, Autonomy did about $430,000 in sales, but they lost all of their hens and crops in the recent flood. A deal with Fertitta will help them recover. Meredith and Nick’s hard work, their determination to persist, paid off. It’s refreshing to see these local, new-wave farmers appear and succeed on a nationally broadcast show. I’ll continue purchasing their delicious eggs at our farmer’s markets and rooting for their success. Anna Smith writes a weekly column about downtown Bakersfield. She can be reached at anna@sagebakersfield.com. The opinions expressed are her own.